So, you’ve decided you want to watch the Great Solar Eclipse by looking directly at the Sun. Super! One of the easiest and inexpensive ways to do so is with solar glasses. These are special glasses that remove all harmful ultraviolet, all harmful infrared and 99.999 percent of intense visible light. It makes you wonder how you get to see anything at all! But don’t worry, there is plenty of light still available with solar glasses to provide great views of the eclipse. Make sure you buy only glasses that are designed specifically for viewing the Sun and are designated as 100-percent ISO certified Solar Safe. Only these types of solar glasses filter out that harmful ultraviolet and infrared light to allow you to view the eclipse safely. DO NOT use regular sunglasses. They will not protect your eyes from harmful solar radiation when looking directly at the Sun. Companies typically sell ISO-certified Solar Safe glasses in packages of five or more. Several companies can accommodate large lots from 50 on up, although with less than three weeks to go before the solar eclipse, bulk orders may not available. If you need large quantities, you should place your order now while companies still have adequate inventory. 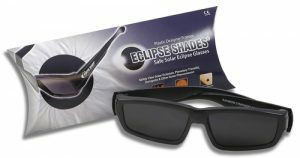 Visit our free (and no you don’t have to provide your contact information) 40 page solar eclipse equipment guide provided at the end of this article to find a list of companies who should still have glasses in inventory. The most basic (and most inexpensive) solar glasses have frames of cardboard holding solar-safe, low-cost lenses. These are sturdy enough to use for the eclipse and fold easily to fit in your pocket. They represent the simplest, most -affordable way to outfit your family for the big day. Also available are more-durable, high-end versions of solar glasses. These can be as stylish as regular sunglasses and, unlike cardboard solar glasses, which should be considered disposable, these should last for years. To learn more how solar safe glasses protect your eyes, we suggest you read this short article by Eric Gentry, an astrophysics graduate student at UC Santa Cruz, studying the intersection of computation and physics. In this article, he explains the design and makeup of solar glasses and how they work. NASA has provided an advisory – How to View the 2017 Solar Eclipse Safely – which provides details on how to safely view the solar eclipse. It provides great information to help you safely plan for the big day. 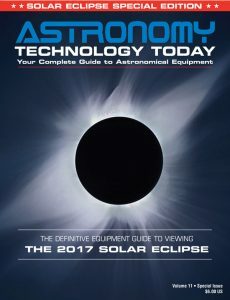 The Astronomy Technology Today editorial staff would like to take this opportunity to remind you of the availability of our Solar eclipse equipment guide – The Definitive Equipment Guide to the 2017 Solar Eclipse. Our goal with the 40 page publication is to provide an easy-to-consume introduction to the technological options for viewing and imaging the Great Solar Eclipse. We cover the gamut of options available including building your own solar viewer, solar glasses, smart phones, DSLR cameras, using astronomy telescopes, solar telescopes, using binoculars, solar filters (including a DYI filter option), CCD astro cameras, astro video cameras, webcams and much more. You can view the guide on our website here – its free and there is no requirement to sign up to read the guide.